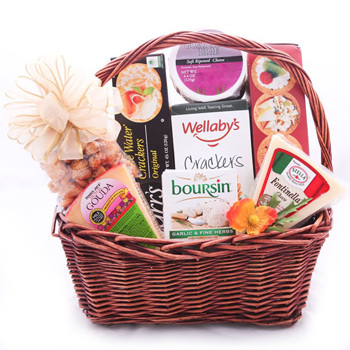 Please with Cheese Gift Basket is the perfect gift for any turophile. This sumptuous gift contains three different imported Cheeses (150 gr each), a variety of savory Gourmet Crackers, and more. Perfect for home gatherings or anyone with a love of dairy, the Please with Cheese Gift Basket is sure to satisfy.